It may surprise you to learn that the majority of all home invasions are performed by amateurs. While securing your home against professional thieves can be difficult, protecting yourself from these amateur burglars is far simpler. We've compiled a list of some of the best home security tips below. Change your locks when you move into a new house. You'd be surprised how many rental companies don't do this, and how many previous renters keep a copy of the key to their old home on hand. Use timers to switch lights, radios, and televisions on and off while you're out so that your home appears to be occupied at all times. Install deadbolt locks on all of your doors. 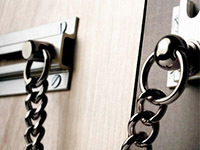 The traditional spring-latch locks are easily bypassed - deadbolts take a lot more knowledge and work. Don't leave notes for family, visitors, or service people on your door. This advertises to thieves that you are out of the house. Always arrange to be home when your professional cleaning service or pest control comes by. If you do have to give up your key to allow them access, perform a thorough background and reference check. Don't keep your spare key in the mailbox, under the mat, or anywhere else where a thief can easily notice and grab it. Instead, wrap it in foil or place it in a film canister and bury it where it will easily be found. If someone knocks on the door asking to use your phone to call the police or a mechanic, keep your door locked and make the call yourself. Install motion-sensing lights around all of the doors to your home. They'll automatically pop on if someone tries to get in, alerting you and scaring the would-be thief away. Ask a qualified locksmith to check that all of your doors and windows have the appropriate locks installed. If you have French doors, have top and bottom bolts installed. Keep ladders, tools, and other garden and garage items locked securely away. Thieves can use these to enter your home. Don't keep keys near a window that can be easily broken. Consider installing a security alarm. Remember to change the code regularly. Fake having a security dog us a great security move. Buy a couple "Beware of Dog" signs at a hardware store and put them up. Place a local security company's sticker on your front entrance. Of course if your personal security practices are lacking, none of the above tips can help you home security. It's important to remember to close and lock all doors and windows to your home, even if you're only planning on being gone a few minutes. Many amateur thieves walk right into homes where the doors or windows were never locked by the family living there. Living in a rural area, household pets, and similar measures aren't enough; thieves look for property's where the home security is lax so that they'll have an easier time getting in and out. One way to check your home security is to ask a close friend or family member to come to the house and point out any weak points in your home security which might allow some to gain access. Don't let other members of your household know, so that they'll use the same security practices that they always do when leaving the house. This will help you see where your personal security practices are lacking. For example, if you have an alarm but don't bother setting it when you're “just running down the road,” it can't deter a thief. The same is true of any other purchased security measures. Keep in mind, even though you only plan to be gone a few minutes, emergencies happen. If something keeps you away for longer than expected, you don't want to come home to find your valuables missing and your sense of security destroyed.